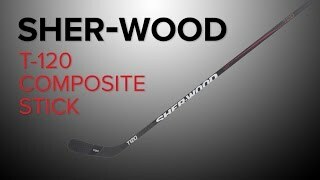 New ideas, advanced methods all combined with original and creative thinking creates a recipe for Sherwoods top of the line, innovative Sher-Wood T120 Grip Composite Hockey Stick. The Sherwood T120 Grip Composite hockey stick is equipped with both Ekore and VRF2 Technology, to create one of the lightest and strongest sticks around. Weighing in at only 395 grams the T120 simply speaks for itself. Sherwood used Pre-Impregnated Carbon Fiber which in laymans terms means the fiber is a reinforced material that has already been saturated with resin, therefore making the fiber much stronger. The Ekore shaft is 5 times thinner than a normal pre-preg by applying less resin and at a much slower pace allowing for better impregnation and ensured durability. Each layer of the Ekore shaft is hand wrapped and then put into a vacuum machine to ensure that all layers are securely sealed to one another while also eliminating any remaining air bubbles or wrinkles. Also built into the shaft like many other composite sticks is mid-kick technology that allows you to unload heavy shots. Yet the T120 is not like other sticks at all. The Sher-Wood T120 actually has a technology all to itself called FFZ which allows you to cut down the shaft up to 4 inches without affecting the flex of the stick. On the lower portion, the T120 blade is manufactured with VRF.2 Technology, meaning the blade sports the same carbon fiber as the shaft does providing enhanced durability. Inside the blade is high-density foam to prevent premature disintegration. Further, the middle of the blade has a carbon bridge that is used to minimize blade torsion. These enhanced features promote durability to keep the Sher-Wood T120 looking and feeling Like New longer than the average blade. Take these new ideas and advanced methods, combine them with your quick hands and fancy moves, and youve got a stat sheet record like no other with the Sher-Wood T120 Grip Composite Stick by Sherwood. Construction Material: EKORE Technology Type of material the product is made of. Blade Construction: VRF.2 Technology Foam Type of material the blade is made of. Family: T120 The product line within the brand.